Apple announced a new iPad on Tuesday at an event focused entirely on the education market. The new 9.7-inch tablet will cost $299 for schools ($329 for everyone else) and support the Apple Pencil, which was previously limited to the significantly more expensive iPad Pro. Apple also announced a bunch of new software tailored to educational needs, including Schoolwork, a classroom management app for teachers that enables them to hand out digital assignments to their students. 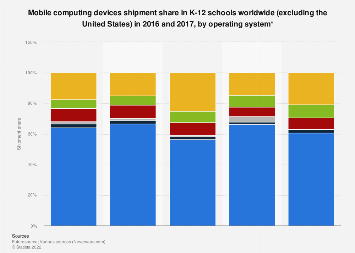 Despite having repeatedly stressed how important the educational market is to the company, Apple recently fell behind Google and Microsoft in terms of their presence in U.S. classrooms. According to Futuresource Consulting, Apple devices accounted for just 14 percent of mobile computing devices (i.e. laptops and tablets) shipped to schools in the fourth quarter of 2017, down from 19 percent for the whole of 2016. Meanwhile Microsoft and Google have improved their market position, with Google’s low-priced Chromebooks proving particularly popular with schools. 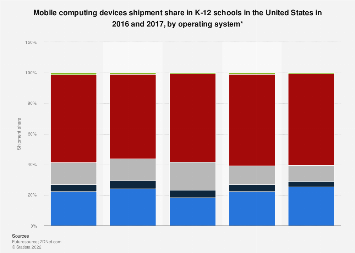 This chart shows the platform share of mobile computing devices shipped to schools (K-12) in the United States.